Sadly, the press has today reported the death of Sylvia Anderson (1927 - 2016), producer and long-time creative partner in the colorful and creative TV/film world of Gerry Anderson. Sylvia Anderson began her career working as a production assistant on such programs as The Adventures of Twizzle (1957-1959), and Torchy the Battery Boy (1960). She also worked as dialogue director on Supercar (1961-1962) and soon became famous and beloved for voicing Lady Penelope on the classic series Thunderbirds (1965). Many TV historians also credit Sylvia Anderson with the unique, unforgettable look and style of live-action cult-series UFO (1970) and Space:1999 (1975-1977) Year One. Ms. Anderson also produced the films Thunderbirds are Go (1966), Thunderbird 6 (1968) and Journey to the Far Side of the Sun (1969). In 1991, Ms. Anderson penned her autobiography, Yes M'Lady, which chronicled her time as a formative and important force in the Anderson-verse. 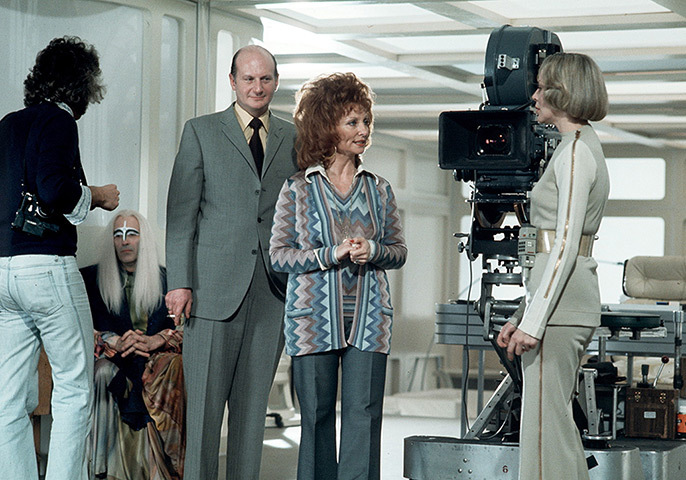 Sylvia Anderson's contributions to cult-TV will live on for decades, but her presence -- and her singular voice -- will be much missed. My deepest condolences go out to her family. Sylvia Anderson with Gerry made SPACE:1999 season one so very brilliant and still one of the most important science-fiction television series ever made. I really appreciated this lady's talents and longevity. If it weren't for the fact that Sylvia Anderson lived to an old age, this would be very sad news.